Rashtriya Janata Dal president Lalu Prasad today asserted that the Congress will form the government in Gujarat. 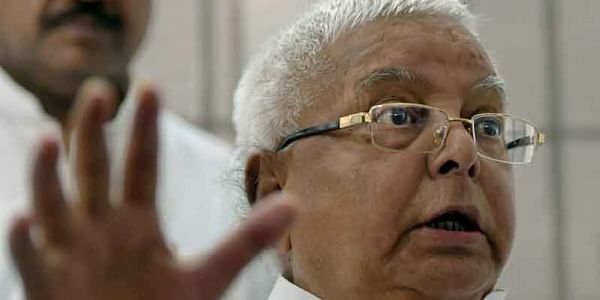 PATNA: Rashtriya Janata Dal president Lalu Prasad today asserted that the Congress will form the government in Gujarat as people have voted heavily in its favour in the first phase of polls. Over 68 per cent turnout was recorded in the first phase of polling for 89 Assembly seats in Gujarat yesterday. "People have voted in large numbers in favour of the Congress party in Gujarat (in first phase of polls). It will form the government there," Prasad told reporters here. The second and last phase of polling in the Western state in 93 seats will be held on December 14 and the counting of votes is scheduled on December 18. Prasad's younger son and leader of opposition in Bihar Assembly, Tejashwi Prasad Yadav attacked JD(U) president and Bihar Chief Minister Nitish Kumar that the party has fielded candidates in Gujarat elections so that they eat into Patel votes and benefit the BJP. "Nitish Kumar does not have any mass base. I am quite confident that the JD(U), if it decides to contest on its own in Bihar, will get the same number of votes in Bihar as it will get in Gujarat Assembly polls," Tejashwi said. The former deputy chief minister said he would launch a programme against Kumar after 'Makar Sankranti' next month to expose Nitish Kumar government's failures.